As you would expect, the Eagle Hip Abduction/ Adduction machine is a great piece of equipment for working your hips and thigh muscles. Yet the Eagle Hip Ab/Ad machine has the added advantage that it has a reclining seat. This feature, unique to the Eagle Ab/Ad machine, allows the user to change the emphasis of the exercise to include other muscle groups that aren’t necessarily activated when limited to a single position. Additionally, by incorporating two exercises in one machine, you are able to exercise both inner and outer thigh muscles without leaving the machine. 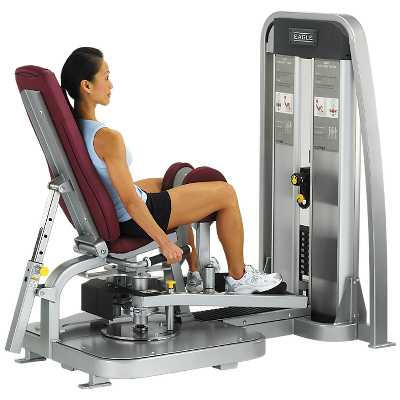 By reclining the seat on the Eagle Ab/Ad machine, you allow the exercises to engage more muscle groups than you would be able to while sitting upright, or visa versa. Reclining elongates relevant muscle groups such as the gracilis (long muscle on the inner thigh) during adduction and tensor fasciae latae (muscle running along the outside of the leg) during abduction. Specifically, the variety of seat positions allows for numerous exercise positions, better aligning the body with one’s natural posture in exercise. Hip abduction is the movement which separates the legs and brings them away from the center of the body. The abductor muscles are located on the outside of the hips. By using the abduction function on the Eagle Ab/Ad machine, you exercise the gluteus medius, gluteus minimus, tensor fasciae latae, sartorius and piriformis muscles. In general, the abduction muscles are responsible for stabilizing your body. The abduction muscles are especially important to runners, walkers and athletes where there is significant lateral movement. Hip adduction is the movement which brings the legs together towards the centerline of the body. The adductor muscles (adductor longus , adductor brevis, aductor magnus, pectineus and gracilis) are those which run down the inside of the thigh. The adduction muscles are especially important to athletes such as soccer players who are kicking the ball with the inside of their foot and bringing their leg across their body. Want to see how to put these facts to work? Here are four unique exercises which can be used to exercise various muscle groups in the thigh. SEATED HIP ABDUCTION: the standard abduction thigh exercise, this exercise strengthens the piriformis muscle which runs across the hip. SEATED HIP ADDUCTION: the standard adduction thigh exercise, this exercise engages the adductor brevis and adductor longus muscles which run down the inner thigh. LYING HIP ADDUCTION: increases the engagement of the adductor brevis and adductor longus muscles shown in (2). This exercise also works the gracilis muscle along the inside of the thigh. Next time you are looking for a new way to exercise your thighs, you should definitely give the Eagle Ab/Ad machine a try. You can also see these techniques demonstrated on My Cybex Coach. Want to share this article with your friends? Send them a Tweet. Cybex is a provider and manufacturer of premium commercial fitness equipment. Content featured in the Cybex Fitness Blog is meant to inspire healthy living and wellness and should not be taken as medical advice. For medical advice please consult a doctor. Learn how to get the most from a chest press workout. How far does it extend .what degree? Price/delivery/instalation?